» Inspire Launch Grow Applications due Friday! Inspire Launch Grow Applications due Friday! 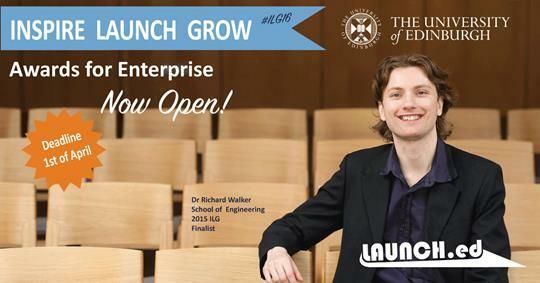 The annual Inspire Launch Grow awards programme and event to showcase the first class entrepreneurial talent across the University of Edinburgh Staff and Student population. Finalists will compete for £14,000 worth of prize money and additional in‐kind support from industry partners. Following a three month application and selection process twelve finalists will pitch at the Inspire Launch Grow event on the 9th of June where they will be joined by an audience of key partners from industry, government and the entrepreneurial ecosystem. The day of pitches will be followed by an awards ceremony to recognise the astounding achievements of the university’s top entrepreneurial talent with three awards.